It was the worst of times. It was the best of times. Well, actually it was a great weekend no matter what the times. I was very relieved that the rain had stopped by the time I awoke in my motel room. With overnight lows in the 30's, rain would mean miserable conditions and possible hypothermia. Had it once and once is enough for a lifetime. I found my usual parking space and headed over to the Omni where I saw a few NCRC people, Bob, Steve and Paul. As I was walking to the start I saw VHTRC friend Martha Wright. She would be running with one of the four men that had run all 29 previous editions of the race. 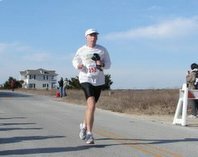 John Price, a long time ultrarunner from Va Beach was at the start next to me after having run Mt. Masochist last weekend. He would go on to get a Boston qualifier today. We were soon away and I was surprised as I passed mile one, how easy it felt even though I was to fast. I had was expected my time to be at least a minute slower the first mile so I tried to slow down, but the next mile was even faster. That's when I stopped to take a picture and force myself to slow down after turning off of Broad Street and onto the lovely Monument Ave. We had been running into a little headwind but it would hardly be noticeable now for a long time. The temperature was great and I was feeling good and confident. The next several miles passed quickly and I had settled into a good pace and was right on track for my goal. I resisted the urge to push too much going down the reverse Lee's Revenge Hill. The next section from about 7 to 10 miles is my favorite on the course. After passing through one of the party zones we cross the James River on the old Huegenot Bridge and then a run a couple of miles along the river. It is very scenic and flat making for most enjoyable running. As the course turns away from the river at mile 10, we enter into a series of hills for the next few miles. The last time I was here I hardly noticed them but today I was not feeling too strong. But as I approached the half I was right where I wanted to be in 1:46:27. The only problem though was the last two miles I had slowed and I wasn't feeling like picking up the pace. Mile 14 was again too slow but the 15th mile is almost flat and I was relieved to find I was right back on pace in 8:06. But then we turned onto the Lee Bridge headed back into downtown and directly into a strong headwind. I could feel my strength being blown away and that mile took over 9 minutes. The next mile is a long slight upgrade mostly into the wind and it too was over 9 minutes. At this point I knew it was about over for the qualifying attempt but I wasn't ready to give up just yet. Mile 18 was flat and out of the wind so I pushed the pace hoping to find I could still run 8:10's the rest of the way . But it was not to be today. I didn't feel bad, but just didn't have the strength to run the pace I needed. Even with pushing effort I was only able to muster an 8:59 mile. At that point I grabbed a cup of gatorade and stepped off the course. My race was over and now it would just be was a fun run to the end. I stretched my legs for a minute while drinking and eating a gel and then began the final 8 mile journey to the finish. My goal now was to just have an easy run and save as much energy as I could for the next days run with Karla. It took a a couple of miles but I soon was running well and the miles passed fairly quickly. I was very happy to reach the end and the downhill finish without cramping and feeling ok. Quatro Hubbard passed me with a half mile to go and urged me to push to the end with him. I declined the offer telling him to go ahead, I was saving myself for OBX now. 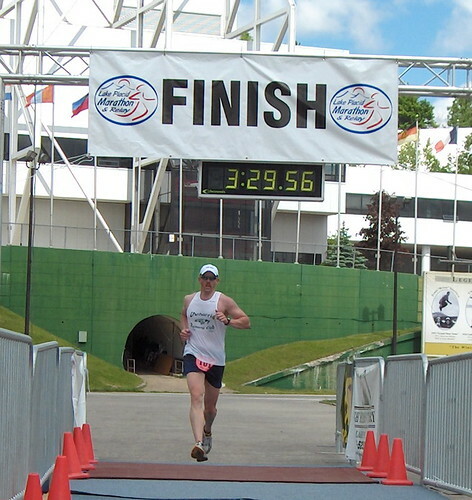 Even with the slowing down, I ended up running my 3rd fastest marathon ever in 3:55, so it wasn't really a bad day. However I would not advise anyone to run 3:55 the way I did today. As usual, they did a great job putting on the event. I made my way to the food tent to try and quickly replenish some of the calories I had expended. I talked to Jeff Branin while scarfing down some pizza. I also had some chocolate milk, the perfect recovery drink in my drop bag. It would have been great to have had a little time to visit with a few friends at the finish but I had to hurry away and make the 3 hour drive to Manteo. The drive down to the Outer Banks from Virginia was uneventful. I stopped a couple of times to stretch my legs and try to stay as loose as possible. I talked to Karla on the phone and she told me the weather had been yucky with rain but the forecast was looking good for Sunday. A quick stop at the expo to pick up my race packet and then I checked in to my motel. I took a quick shower and then headed over to Manteo for a nice dinner with the Werners and Jerry and Linda. I was tired of course and with another early morning wakeup call ahead we all retired early. On race morning the shuttles to the start were right on time and very efficient in getting the runners to the starting line. I quickly found Karla and Jerry as well as Margaret Cooper and Lisa Howell from Raleigh. After the disappointment with yesterdays time I was looking forward to just having some fun running with two of my best friends. This would be an especially great day running with Karla again. Last year was special, but with her undergoing the cancer treatments it was a difficult slow run for her. She has been growing stronger in her recovery at an amazing pace lately and I was hoping she would have a good run. Her goal was 4:30 and if things went well, maybe 4:22, a 10 minute pace. I was also hoping that I would feel good enough to stay with her the whole day after running so hard on Saturday. Jerry lined up with us with his own goal of trying to get to the finish in as good a shape as possible after not training nearly enough over the past year. We lined up near the back planning to start off very relaxed and gradually pick up the pace. As we began, my legs were a little stiff and sore but not nearly as bad as I expected and within a half mile I was loosened up and feeling pretty good. The first mile came too quickly though in 9:35 and the second mile even quicker in 9:25. At that point I told her I would take over the pacing. She was feeling great but we had a long way to go and now was not the time to be pushing. Over the next few miles our pace varied a little but we had settled in to about averaging 10 mp. It was a gorgeous, sunny morning with the temperatures in the mid-40's, near perfect for racing.There was a steady wind about 10mph with gust up to 18 but unlike last year the wind would be at our backs most of the day giving us a gentle boost. The three of us remained side by side enjoying ourselves, the great conversation and the beautiful scenery for the next several miles. We passed by the waterfront on a greenway, then through nice residential areas. We approached the Wright Brothers Memorial and this year due to some minor course alterations we circled the entire monument still feeling good and having fun. Around 10 miles,the course enters Nags Head Woods, a very pretty natural area of wooded dunes. It is a dirt surface through here with several gently rolling hills. Nothing too steep or too long but enough to effect the pace a bit. Jerry had pulled slightly ahead of of us for some reason but Karla and I continued enjoying our time together doing what we love most, running and talking. After about 2.5 miles the course turns off the dirt road and climbs a single track trail over a sand dune for about a half mile. The surface is soft dirt and pine needles. I told Karla that I think they should re-surface the trails on Massanutten Mt just like this. The trail comes out of the woods at the 13 mile mark and Jerry slowed and waited for us. Our time at this point was still slightly faster than Karla's fantasy goal of 4:22, even with the slowest mile of the race just behind us on the trail. That 13th mile on the trail over the dunes was our slowest of the day in about 10:50 and I expected that we would not be running any more sub-10 minute miles. Boy was I wrong. Karla was feeling great and after a 10:02 14th mile the pace began to pick up again. She was working me a lot harder than I expected and I was thinking to myself that I hoped we could both hold the pace. Jerry was still hanging with us but as the pace picked up we could tell he was began to feel the effects of little training. We ran a 9:47 and a 9:44 before turning off the highway again. At that point Jerry sent us on our way with best wishes and backed off the pace. We turned into the wind for about a half-mile and it took us 10:02, the last time we would be over 10 minute pace. We were both surprised the next two miles were a couple of the fastest of the day. Karla was still looking great (as always) and I was feeling better than I had a few miles back. Now we only had a 10K to go with one big hill, the Baum Bridge between us and downtown Manteo. We continued to run well the next couple of miles, and as we approached the bridge I was afraid I would have to walk part of it and then try to catch Karla on the downhill side. It was a pleasant surprise to me that I felt fine and we powered up to the 23 mile mark atop the bridge in 9:55. Still going strong we finally made the turn towards Manteo with just over a mile to go. This was directly into the wind and for the first time Karla told me she was feeling tired. One more right turn and the finish line was just ahead. We were all smiles as we crossed in an amazing 4:18:57 surpassing even her fantasy goal for the day. Not only had we run a negative split but averaged almost 15 seconds a mile faster the last 10K than we had the first ten miles. Frank was there with the camera to greet us and after a few minutes we started to make our way around to watch for Jerry. We didn't make it as Jerry had continued to run well after backing off our pace and finished under 4:30 and we found he and Lynda walking towards us. What a wonderful day spent with wonderful friends. I am so happy to see that Karla is improving so fast and I know she will be back better than ever by next Spring and get her Boston qualifier. The OBX people did a great job with the race this year. All of the minor problems from last year's inaugarul race were corrected and improved upon. The minor course adjustments and the new finish line in the historic downtown Manteo waterfront area were appreciated by everyone. 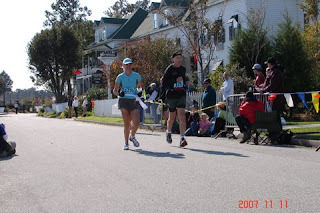 I took some photos while running in both races although it was hard to take too many while running faster in Richmond. Frank added a few from the finish. You can view the photo web album here. Sounds like another great weekend of running...nice work on both of those runs! Thanks Matt and Jeff. Overall It went well but I don't think I'll make a habit of it. Missed you at Masochist this year. Sounds like you had a great time with the "double" weekend. Sorry the qualifier didn't work out but I am sure you will get it this Spring. Look forward to seeing you soon. I read your MMTR report and was pleased to see you did well despite the low amount of training this Fall. I definetly plan to be at Masochist next year.